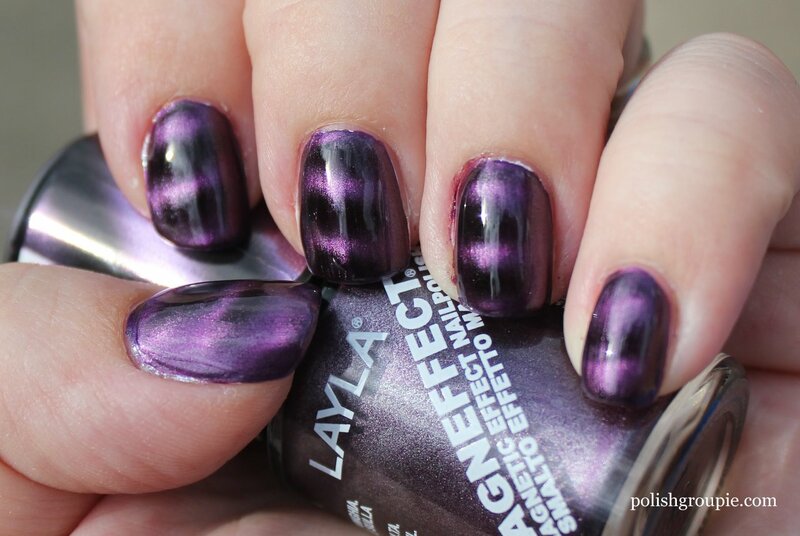 It’s metallic day in the 30 Day Challenge, so today I’m showing you Layla Magneffect magnetic nail polish in Purple Galaxy. 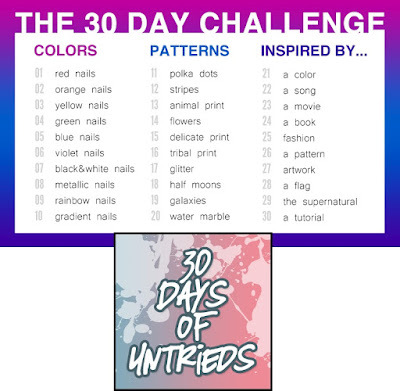 This was my first time using it, so it fits the bill for 30 Days of Untrieds too. I picked this up with my Ulta Rewards last month had have been anxious to compare it to Sally Hansen Magnetic Nail Color, which I recently tried. I used one coat of Loreal Jet-Set in Nightlife as a base to reduce the amount of the Layla Magneffect I would need to use (at $15.50 a bottle, it’s not cheap). 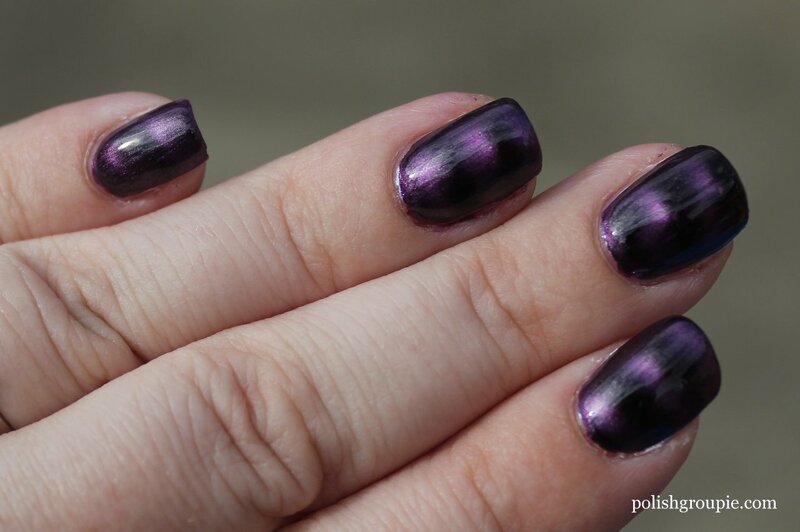 Loreal Nightlife is a grape purple shimmer polish that’s similar in shade to Purple Galaxy. Next I applied a thick coat of Layla Magneffect Purple Galaxy to one nail and held the magnet as close to the nail as possible for about 10 seconds. The directions say to do it for 5 seconds, but just wanted to be on the safe side. I finished it with one coat of Poshe fast-dry top coat. The magnet is attached to the top of the the brush handle so you just turn it upside down to use. The magnet creates a straight line pattern,and there’s a line across the magnet to show you the direction of the pattern. So if you want vertical lines instead of horizontal or you want them at a diagonal across your nails, just turn the magnet accordingly before you use it. The polish went on very smoothly, but I did have a little trouble with the magnet. On one nail the pattern didn’t show very well the first time, so I did another coat and tried again. Turned out better the second time. The magnet wasn’t able to cover my full thumb; perhaps the curvature was too much but the pattern just didn’t show up on one side of my nail, even after I tried it a second time. Next time I’ll try rotating my nail as it’s under the magnet to see if that helps. I do like this polish quite a bit; the color is deep and rich, very eye-catching. I’d be curious to try it with different magnet patterns. I thought this one was a little harder to use than the magnet that comes with Sally Hansen Magnetics. Sally Hansen includes the magnet as part of a separate cap that goes over the top of the bottle, so it’s not attached to the brush. I like that better: no worries that the polish will run or drip down the brush as you turn it over to get to the magnet. Sally Hansen also has added a small lip to the magnet cap that rests against your finger and acts as a guide. It makes it easier to hold the magnet steady and shows you how far away to hold it for best results. 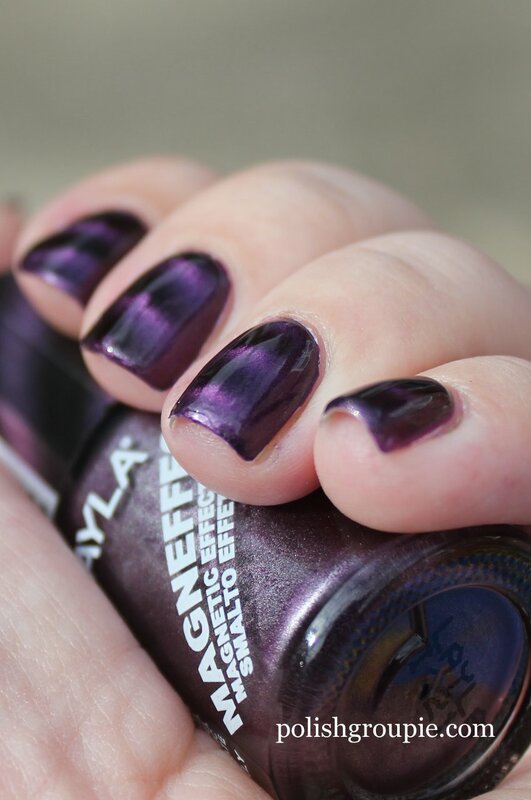 What’s your take on magnetic polish? Have you found one that’s easy to use?